Syracuse Opera is preparing to close their 2018-19 season with Kurt Weill’s “The Threepenny Opera.” Artistic/Music Director Christian Capocaccia and several cast members came to the WCNY studios to give us some insight into the production, and shared a bit of music with us as well. 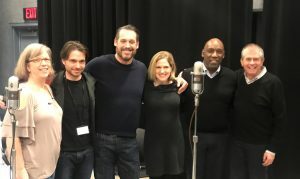 We were thrilled to have Peter Kendall Clark (Macheath), Amy Justman (Polly), and Gregory Sheppard (Tiger Brown), along with pianist Richard Cordova (who has conducted two productions of The Threepenny Opera himself) in the studio with mid-day host Diane Jones. Find out more about Syracuse Opera here.